Extant literature on nineteenth-century landscape photographs of the American West—frequently made for government surveys and commercial markets following the Civil War—focuses largely on their circulation among distant audiences, such as armchair travelers and urban industrialists in the eastern United States. This scholarship also examines the ideological work that these images performed for remote viewers—forming collective imaginaries about largely unseen locales, luring migrants and investors through Edenic views, and celebrating government-sponsored exploration.1 But how did these pictures of western spaces function not for faraway spectators, but rather for local communities and settlers? How did photography contribute to making meaning in an unknown landscape for people just arriving to a new territory? Rachel Sailor addresses this previously understudied question in Meaningful Places: Landscape Photographers in the Nineteenth-Century American West and in so doing greatly broadens our conception of western American photography. Focusing on resident western photographers who produced works for local audiences, Sailor argues for its equivalent importance to that by nationally famous practitioners—like William Henry Jackson and Timothy O’Sullivan—in the development of Euro-America’s comprehension of the region. As she explores throughout her text, photography served as a central element of settlement, as diverse communities across the West used the medium to domesticate unfamiliar terrain, capturing it within preexisting landscape conventions and constructing local narratives of both history and progress around it. Sailor focuses on six chronological case studies from the 1850s to the 1930s and demonstrates that although local practitioners in the second half of the nineteenth century concentrated on vastly different places, the use of landscape photography as a strategy for community self-definition remained remarkably consistent. Her first four chapters illustrate this regularity and address the works of Thomas Easterly in St. Louis in the 1850s and ‘60s, Joel Whitney’s work in 1860s St. Paul, Minnesota, Peter Britt’s 1870s views of southwestern Oregon, and Solomon Butcher’s 1880s photographs of Custer County, Nebraska. 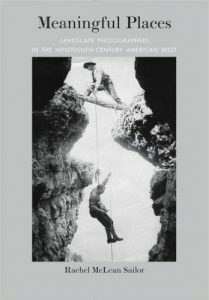 The book’s final two chapters, however, move into the first third of the twentieth century in order to examine a “nostalgia for the local professional photographer of the proceeding decades” (xxvii) represented by the Kolb Brothers of the Grand Canyon and the much more well-known Ansel Adams. In her analysis of these pictures Sailor employs a methodology rooted in social history, consistently analyzing the historical practices through which they acquired meaning. She also pays particular attention to their materiality, focusing on the changing photographic technologies and formats over the period she discusses, and the disparate ways in which the photographs were experienced. Against the rich diversity of Sailor’s case studies two strong thematic threads emerge. The first is the repeated propensity of the nineteenth-century western settler to claim, through photography, the natural and cultural wonders of the region for a specifically Euro-American historical narrative. This act of appropriation often involved the active suppression of contemporary Indigenous lives and stories, in favor of a fabricated history or much more ancient cultural past. The second emphasizes the settler’s active engagement in physically reshaping their new landscape. The latter theme serves as the subject of chapter one, which addresses a series of Thomas Easterly’s daguerreotypes, executed over the 1850s and ‘60s depicting the sequential destruction of a large earthen burial site in St. Louis created by ancient Mississippian cultures. Easterly settled in St. Louis in the 1840s and created the bulk of his works for the city’s residents, exhibiting images of nationally famous personages and documenting regional technological projects in his gallery. The so-called “Big Mound” was one of many such monuments in the region around the Mississippi constructed by different generations of mound-building cultures between 800 and 1200 AD. The imaging of this demolition, Sailor argues, visualized the obliteration of the old and the idea of progress through technological growth, as St. Louisans used the soil from the embankment to both convert a local wetland to buildable ground and lay railroad track. The daguerreotypes also demonstrated the ways that Euro-American settlers confronted the Native history in the landscape and appropriated it for their own uses. For example, contemporary Anglo-authors romantically described the antiquity of the structures and insisted that living Indian cultures could not have created such works. Digging through the remains of the mound, therefore, “curiosity hunters” meditated on “some relic of the past age,” but were not encouraged to connect the site’s relevance to neighboring Indigenous communities (17). The book’s second chapter discusses Joel Whitney’s photographs of Minnehaha Falls, and his creation and circulation of views—especially in the form of cartes de visite—taken in and around Minneapolis and St. Paul, Minnesota during the 1860s. The falls acquired a particularly iconic status over the second half of the nineteenth century because a daguerreotype of the location taken by Whitney and Alexander Hesler purportedly served as the inspiration for Henry Wadsworth Longfellow’s epic poem Hiawatha (1855). Although Whitney capitalized on this literary connection by including quotations from the poem as captions for his cartes de visite, Sailor persuasively argues that his pictures of visitors to the falls on bridges, paths, and rocks increasingly emphasized local culture over the course of the ‘60s. Sailor also analyzes the way that Longfellow’s Hiawatha linked the waterfall with the region’s Anishinaabe and Dakotah past in the popular imagination. This connection between the physical landscape, contemporary literature, and an Indigenous past created the sense of a long—and regionally bound—cultural history. However, as Sailor explores, Longfellow’s text related less to local Native experience and legend than his romantic reimagining of it, and the patchwork of references he employed to create the work. Chapter three examines Peter Britt—a photographer with a successful commercial studio in southwestern Oregon—and his 1870s images of Crater Lake, which aided in the development of Crater Lake National Park. First encountered by Euro-Americans in the 1850s and ‘60s, the site was viewed with a sense of awe and reverence but had, in fact, already been long regarded as sacred by surrounding Native groups. A volcano that erupted around 7,900 years ago and fell in on itself, the locale became a tourist destination and, with the development of geological theories around it, “citizens of the American Republic,” saw themselves as “inheritors of a very ancient and dynamic past” (61). Britt took his first successful photograph of the lake in 1874 and continued to represent it with his camera and in paint for the rest of the decade. Employing both sublime and picturesque conventions, he circulated his large-format prints and stereoscopic views among residents in the nearby town of Jacksonville. In her analysis, Sailor compares Britt’s works to that of the more well-known Carleton Watkins, arguing that Watkins’s pictures of Yosemite embodied a national, as opposed to a local landscape. Watkins’s California views, she maintains, represented the American future, while Britt’s images of southwest Oregon proved particularly meaningful to local residents, as a “counterpart to their experience as immigrants…a reward for an arduous journey completed” (72). Sailor continues her examination of local nineteenth-century western photographers in chapter four, which treats the project of Solomon Butcher. Intending to compile an album, Butcher captured hundreds of images of homesteaders in front of their sod houses in his local Custer County, Nebraska in the 1880s and ‘90s. Due to the sparse population in the area, Butcher traveled to the region’s residents and photographed them onsite, rather than operating out of a studio. The results of his endeavor are pictures of homestead families on their own properties, in front of their homes and often showcasing both prized possessions and livestock. The pictured subjects, to whom Butcher sold prints as well as subscriptions to the larger album project, provided a family history along with likenesses. These works, Sailor argues, are best considered “portraits of both place and people,” and one sees in them the inextricable link between the two (82). They show the sitters engaged in molding and constructing their landscapes, and by extension their destinies, in the American West. As Sailor indicates, many of these early sod pictures did not appear in Butcher’s final book project of 1901, Pioneer History of Custer County, as an 1899 fire tragically destroyed most of his recorded histories. She examines both this tome and archive, however, focusing on the way that Butcher used the details of individual lives to create a community narrative. Shifting into the twentieth century, Sailor’s last two chapters focus on case studies that explore nostalgia for the nineteenth-century pioneer photographer. The first discusses the Kolb Brothers of the Grand Canyon. Ellsworth and Emery Kolb opened their studio on the south rim of the canyon in 1903 and, as Sailor asserts, their pictures exploited a popular longing for a previous era of western exploration. Their camera-images effectively drew upon this sentiment by emphasizing their work in perilous terrain, conveying “their dedication and mettle as ‘view hunters’” (105). Highlighting the adventure and danger of photographing in this landscape, the brothers were “essentially enacting an earlier form of western photography for tourists” (108). Their own activities, therefore, became the subject of the work, as epitomized by a 1911 film they made of their voyage down the Colorado River. Alternating between sequences recorded form their perspective in the boat, and those showing them fighting oncoming rapids taken from the shore, the motion picture allowed for viewers to vicariously experience the journey. Both the brothers’ residential familiarity with the region and the perceived documentary transparency of the film served as sources of its validity. In the final chapter Sailor analyzes Ansel Adams’s work and its connections to earlier western photography. Unlike the nineteenth-century practitioners discussed in the first four chapters Adams “did not believe…he was inventing or creating place identity.” Rather, he emphasized a new modernist conception of place “rooted in deep emotion and artistic sensibility” (142). Sailor argues, however, that although different from previous pioneer photographers, this rhetoric enabled Adams to capture his own authentic experiences of the West. In particular, Sailor is interested in Adams’s shift from pictorialist to straight photography in the early 1930s. She claims that this allowed him to conserve a more direct link to nineteenth-century western practitioners and “break from the perception of that earlier style as ‘documentary’” (148). Considering Adams’s 1938 album, Sierra Nevada: The John Muir Trail, she demonstrates how the sequence of images suggests an intimate, physical experience of the terrain. Sailor’s study of resident western photographers demonstrates impressive breadth and expands the literature on the role of the medium in the Euro-American settlement of the region. Full of previously unpublished camera-images from western state historical societies and museums, as well as well-known national collections, Meaningful Places offers a rich beginning for more locally oriented histories of photography in the nineteenth-century American West. As Sailor emphasizes landscape as a cultural construction shaped by incoming Anglo populations, however, one wonders what these case studies might look like from a transcultural perspective. For, in the course of shaping their terrain, settlers were also a part of a larger process of appropriating, annihilating, and fundamentally altering the preexisting Native landscape. Sailor certainly touches on this throughout her text and acknowledges that she does not seek to reconstruct American Indian cultural landscapes. However, in her Afterward she includes a quote from Hopi photographer and filmmaker Victor Masayesva, Jr. that “photography reveals to me how it is that life and death can be so indissolubly one; it reveals the falseness of maintaining these opposites as separate (164).2 Taken from a larger passage that speaks to the indivisibility of Euro-American and Indigenous histories, the inclusion of this quotation serves as a point of departure for future, more locally oriented studies that might build upon Sailor’s work and take an intercultural approach to the subject. About the Author(s): Emily L. Voelker is a doctoral candidate in the History of Art & Architecture at Boston University.